I was raised in Montreal to a French speaking family. I traveled out west when I was 21 years old looking for new grounds to explore and the phenomenal ecological diversity and beauty that Brithish Columbia has to offer captured my heart. I permanently established myself in B.C. and started a family. 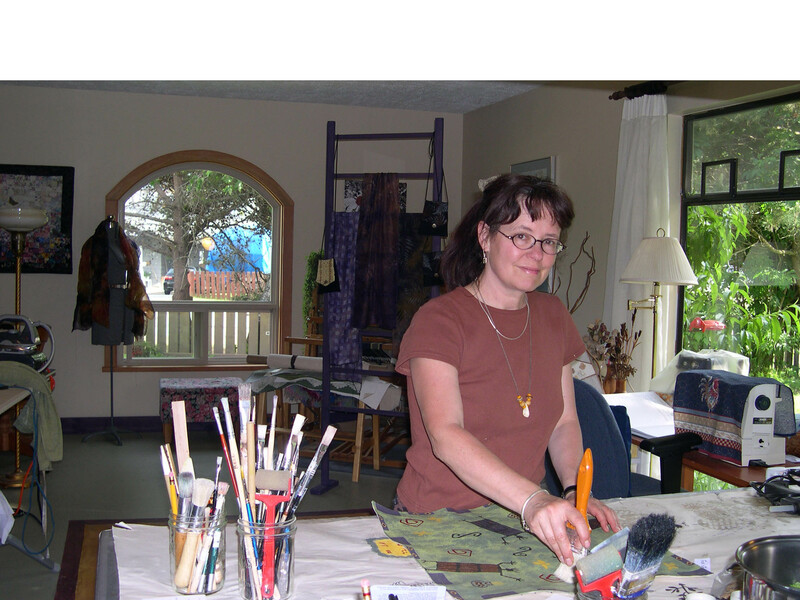 A few years ago I decided to pursue my creative abilities and graduated from the Textile Arts Program at Capilano College in North Vancouver. My areas of interest lie within the weaving and surface desigh disciplines. I work at home in my "Laughing Frog Studio" creating garments, accessories and preparing and offering workshops. As a textile artist I am exploring and expressing my passion for beauty and my most inner emotions through textile art. I tend to create mostly wearables and within the completed item I find accomplishment and fulfillment. I work especially with natural fibers and dyes as they give me great tactile and visual pleasure and they are my contribution to protectiong our environment. Fiber Art is my passion. I draw my inspirations from the essence of the natrural world. Elements of nature, landscapes of colours, texture and shapes are translated into designs and are reconstructed onto natural fibers as a celebration of the wonderful spiritual world of nature. I have chosen and am committed to work with natural dyes and fibers. Natural dyes have remarkable tinctorial properties and the extensive palette of hues released by these dyes are naturally in harmony with the human eye. The process of dyeing with natural pigments is more extensive than synthetic dyes but I strongly believe in the global maintenance of our planet and therefore in contributing to the protection of the environment, our health and safety. Natural dyes have been used traditionally throughout the history of textiles. The art of natural dyeing is alive in all my original creations. 2005-Feb. case show at the Foyer Gallery of the Squamish Library. Cushions, purses, scarves. 2004-summer- Pendulum Gallery in Vancouver through Circle Craft. Silk/hemp with organza overlay. All natural dyes plus overprinted with silver leaves. 2002-2003 - Foyer Gallery of the Squamish Public Library - Shibori and devore silk scarves, purses. 2000 - Foxgloves Fibre Arts Guild and art gallery. - Textile Arts' program student show at Capilano College, N.Van. - Graduated Perspectives, North Shore Exhibition and sale of works by Textile Arts and studio Art allumni. Capillano College, N.Van. 1999 - Community Arts Council, Van. B.C. Davie Street. - Round House, Van. B.C. Fall show, Gathering Threads. 1998 - Foyer Gallery, Squamish Library, raffia hats, woven items. Circle Craft- Granville Island, B.C. Starfire- Horseshoe Bay, B.C. Seymour Art Gallery, Deep Cove, B.C. Please tell me when Micheline Brien-Bell adds new art. Or click here to send an email to Micheline Brien-Bell. Micheline Brien-Bell is a member of the www.MyArtClub.Com Art Community.